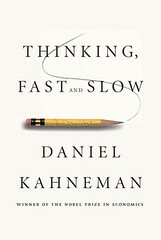 Daniel Kahneman's 'Thinking, Fast and Slow' is a work of authority in the area of psychology. This book is concerned with judgments and decision-making. His research with Amos Tversky was focused on biases, heuristics, and choices. He tried to find out the reason behind the brain's response to familiar illusions. He was awarded the Nobel Prize in economics in 2002. Although he was a psychologist, he got a Nobel Prize in economics because the prize was intended to be given for work in social sciences but was given for 'economic sciences' to please physical scientists. He said that he would have shared the Prize with Amos Tversky had Amos been alive. Indeed, throughout the text, there are innumerable references to Amos and the book seems to be the joint venture of Amos Tversky and Daniel Kahneman. The research of Kahneman opened avenues of multidisciplinary research involving psychologists, psychiatrists, economists, and neuroscientists. Collectively they can be called decision theorists. The author talks about two systems of mind - system 1 and system 2. Remember that these systems do not have any physical presence in our brain but it is a lot easier to talk about the different actions performed by brain while talking in terms of these systems. The mind has associative mappings of many things in the world. When something is required from these mappings, system 1 comes into action. This happens when you calculate 2 + 2. System 2 springs into action when something is given to solve which is not on your fingertips or which requires calculations. This happens when you are asked to calculate 17 X 53. System 1 always comes in the picture and because of ready-made responses to many problems that it has, it is prone to illusions and biases. According to Kahneman, system 1 is the hero of this book. System 2 is lazy and it takes an effort to bring it into action. When it is involved, pupils dilate and they can be a good measure of the effort being put in by a person. There have been stories in which customers have used goggles to hide their pupils so as to avoid being seen as interested in a product. As system 2 is lazy, it rarely comes into picture when people are tired and that is why prime time advertisements, which are aired when people are just back from office, are most effective, because what you see is all there is. Kahneman talks about the 'theory blinding' where an established theory is perceived to be so true that any observed deviations from that theory are considered anomaly and are not given much importance. Consider an example. Let us assume two persons A and B have $5 million each today, but they started with $1 and $9 million respectively. According to rational agent theory, they should be equally happy because they have the same amount of money. A rational person does not give importance to how it got there. At least this is what economics has to teach about a rational person. It can be clearly seen that person A and B will not be equally happy. To explain such anomalies Kahneman describes prospect theory. In fact, differences between economist's rational agents and human beings have been so stark that former was given a name Econ by Richard Thaler. The part 4 of the book is concerned with a comparative study of Econs and humans. Prospect theory contributed much to behavioral economics and nowadays many policies have been launched to protect humans against their own biases, contrary to what is believed by Chicago school economists who think humans to be rational agents who do not commit a mistake. The author then talks about two selves - experiencing self and remembering self. Experiencing self is one which lives in a moment. Remembering self is the one which recollects the moments afterward and feels pain or joy. To explain it in a better way, let us say you were told that you are granted your long-held wish but you will completely forget about that wish after getting that. If you still go for that, experiencing-self is dominant and if you say no, remembering-self dominates. Remembering-self suffers from peak-end effect and neglect of duration. We, humans, remember only strong experiences of happiness and sorrow and this memory is tilted towards the end of the experiment period. Also, there is neglect of duration which says that if a person was too happy for one year and in another instance moderately happy for five years, most of the people will choose former instance completely neglecting time integral. The presentation of theories of psychology to a not-so-specialized audience in this book is commendable. The book is not laden with psychological and statistical jargons even though there are instances where probability has been used to understand decision making. Fictitious characters system 1 and system 2 have made the book interesting. Kahneman tells many interesting stories regarding biases of humans. At many places he posed questions; answers to which might look like irrational but our decision-making is not strictly rational. Many conclusions seem obvious but they violate the rational agent model. This book is highly recommended if you want insights into the decision-making process of the mind.